About 30 people waited for the opening of the Microsoft store in Boston on July 29, 2015. The normally lightly trafficked Microsoft store in Boston saw a little more action on Windows 10 launch day, but most people weren't interested in the new operating system. 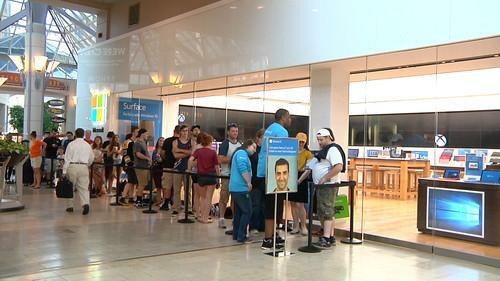 The store was giving out free tickets for fans to meet Boston Bruins hockey player Patrice Bergeron later in the day. Among the 30 people in line, there were still a few Microsoft diehards. See a video from the Boston launch. Ashley Kwon arrived around 6 a.m. and was the second person line. "I actually got up at 2 a.m. to update three of my machines," he said. During his wait, he won an Xbox One as part of a raffle. He said he already has one of the consoles, but would use the new one in another room. He said he is most looking forward to Continuum, the feature that allows the OS to adapt depending on which device it is being used. At 5 a.m. Louis Ciano, III got in line. "Everyone is interested in the 'staht' menu," he said with the traditional dropped-R Boston accent. Ciano was one of five million who were part of the Windows Insider Program. He had been testing the operating system and providing feedback to Microsoft. Many of the Bruins fans who were in line didn't stay at the store after getting their tickets. After 30 minutes only about a dozen people remained inside.